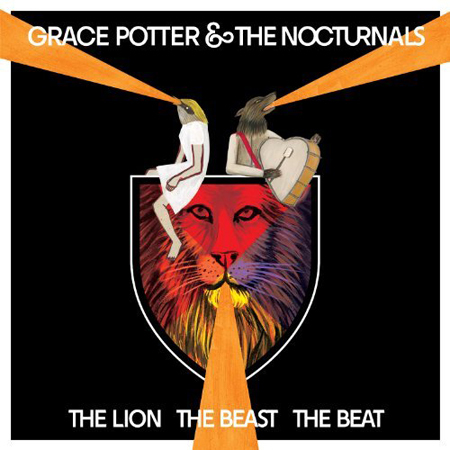 Since the release of their last album, the self-titled Grace Potter & the Nocturnals, Potter has gone from throat-ripping Janis Joplin-esque blues rock singer to one of the most highly-sought after collaborators in country music. Has the new-found exposure effected the sound on her new album The Lion The Beast The Beat? In a word 'yes'. There is definitely a more polished sound. A conscious effort seems to have been made to make songs like the grandiose "One Heart Missing" into legitimate radio hit threats. That means there's a drum machine that appears every now and again. It's a very foreign sound on cuts like the catchy "Never Go Back" and "Runaway". It most sounds out-of-place on "Parachute Heart", which at times is reminiscent of Blur's "Coffee & TV". The experiment that works without reservation is "Turntable". Potter sounds like a gravelly-voiced Emily Haines in delivering an incendiary, sexed-up performance. The blues rock is still The Nocturnals' bread and butter and it is what they do best. The dark yet playful R&B of "Loneliest Soul" is a case in point. The big Led Zeppelin-inspired "The Divide" closes things with force. Potter is renowned for her big booming vocals, and it's the songs that feature that as a centrepiece that are the strongest. When she unleashes her ample lungs on songs like "Keepsake" or the otherwise cheesy "Stars", you are experiencing something special. She takes a slightly different approach with her delivery on the title track, coming across as more O'Riordon or O'Connor than Joplin, but proving more than capable at that style too. Despite some sterilized tracks designed for mass appeal, the deep-seeded grit that lies at the heart of Grace Potter & the Nocturnals' work can't be glossed over. And that's a good thing. Grace Potter & the Nocturnals play The Phoenix in Toronto on August 17th. Best tracks: "Turntable", "Lonliest Soul"